You may have heard rumblings about the upcoming Google Chrome 68 changes. For months, Google has been warning users that all websites will need to have SSL Certification for their Chrome browser, or be forever doomed, “NOT SECURE”. This update, slated for July 2018, has been in the works for years in an effort to improve user and page security. To be clear, this is not currently a requirement, and a potential customer can still proceed to any site, with or without the SSL certification. However, trends indicate this will be a standardized condition for secure websites in the near future. SSL stands for Secure Sockets Layer, a method that allows encryption of data being transferred over a server. SSL Certificates will help secure sensitive information and establishes an encrypted connection, leaving consumers less vulnerable to hackers. Build trust in your site, your brand, and your customers. Keep your site secure and data encrypted. Ensure stable Search Engine Optimization (SEO) and the ability for people to find you. 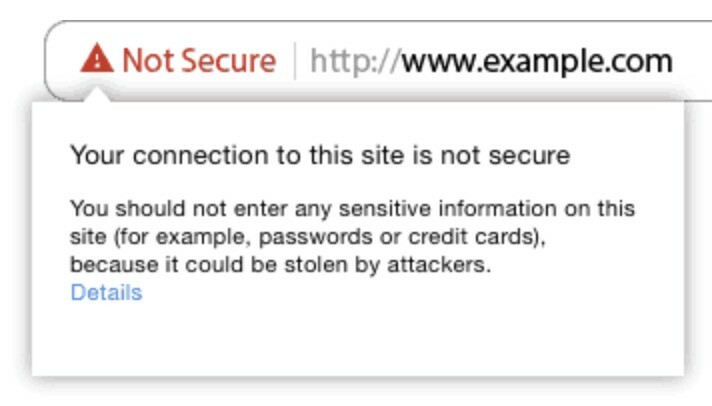 Google will start to push non-SSL certified sites to bottom of the results page. It is in your best interest to update your website security sooner rather than later. There are a variety of certificate options available, depending on your website size, needs, and usage. If you have an account with a technology or server manager, contact them for more information. Often, certification and upgrades are available, or included, with your membership. Red Technologies is at the forefront of web security, SEO, and marketing needs. In addition to free website and online brand evaluations, their experts are available to consult on web security issues and SSL certifications. Contact Red Technologies today at info@redtechnologiesinc.com to learn more about website security.